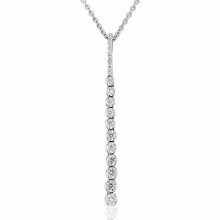 18ct White Gold long drop earrings with claw set brilliant cut Diamonds. Easy hook ear fittings and a sleek, contemporary design. Can be worn alone or with the matching Necklace (2V98W) for added drama.